After going through a couple of changes with their vocalist, the Finnish symphonic metal band is finally having their first show here in Asia! There are changes in their music but nevertheless their identity still remains the same. From having former vocalist, Tarja Turunen to Anette Olzen (former vocalist of Alyson Avenue) and now Floor Jensen, the band has never stop going despite all the changes. With eight album released including the latest Endless Form of Beautiful record and eight different music styles that comes from different inspirations and influence of lyrical themes, they will definitely bring you to a whole new world during their performance. Their first release of Angels Fall First has reached 31st on the Finnish Album Chart in 1997 in Finland and made their live debut in hometown, Kitee, in November in the same year. The band released another full length Oceanborn album on the following year and it became an instant success in Finland, being number 5 on Finnish Album chart and slowly gaining international success when Spinefarm released Oceanborn internationally because of the album single’s, Sacrament of Wilderness success. Their third album, Wishmaster was charted number one on Finnish Album chart and certified gold when it remained on the charts for three weeks. German’s magazine, Hard Rock, declared the album as the Album of the Year, competing with releases from well known names such as Bon Jovi and Iron Maiden. The band finally made their way on their first world tour down to South America, Mexico and Canada along with their first headlining European tour with Sinergy and Eternal Tears of Sorrow. The band’s success didn’t stop there. After so many success and so many ups and down with the dismissal of Tarja Turunen, they made another successful release of Imaginaerum with one of their former lead vocalist, Anette Olzen in 2011. In the following year, keyboardist-songwritter, Tuomas Holopainen co-wrote a Finnish-Canadian film of Imaginaerum that was released in November 2012. After getting this far and the dismissal of Olzen, Nightwish has finally made another release of their latest album Endless Form of Beautiful with their new lead vocalist, Floor Jansen and touring Asia for the first time ever next year, January 2016. Early Birds and VIP tickets are already sold out! Only standard tickets are up for grabs. Get it on SISTIC before it’s too late! 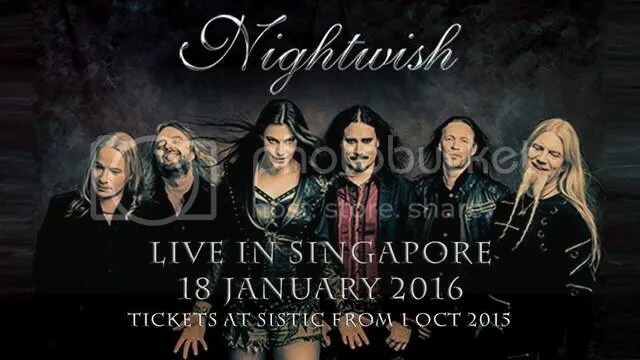 You don’t wanna miss this once in a lifetime Nightwish experience in Asia.